Private equity firm JC Flowers has stepped up efforts to take control of Northern Rock - putting together a management team in case a deal happens. The US firm said it would appoint former Marks and Spencer chairman Paul Myners as chairman of the bank. Other high-profile executives have also been lined up for board positions. The news could ignite a bidding war for the UK lender after a consortium led by Richard Branson's Virgin Group proposed an offer earlier this month. There have been reports that JC Flowers had set aside £15bn to buy Northern Rock, the first major UK bank to be brought to its knees by the seizures in the credit markets which followed the crisis affecting US sub-prime home loans. Other executives assembled by JC Flowers to run the bank if its offer was successful, include former Alliance and Leicester chief executive Richard Pym and Hugh Scott-Barratt, the ex-chief financial officer of ABN Amro. 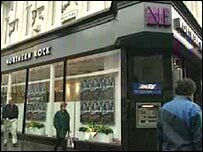 Northern Rock's shares ended 1.7% up at 190.7p on Friday. They are still more than two-thirds below their price before the bank was forced to go to the Bank of England for emergency funding on 14 September. Last week, Northern Rock said it was continuing to negotiate its position with a number of "potentially interested" suitors. They include the Virgin-led consortium, also featuring US insurance company AIG, which has offered to buy a majority stake in the bank and inject "hundreds of millions of pounds" of money in exchange for taking control and rebranding the business as Virgin Money. Any future owner of Northern Rock will need to pay back hefty loans to the Bank of England which it has borrowed in emergency funds. Over the past week, the bank is likely to have borrowed a further £4.65bn, according to the latest Bank of England data. The figure appeared in the "other assets" category of the Bank of England's accounts, which includes any funds the Bank issues as "lender of last resort". Analysts believe it is highly likely that this money has gone to Northern Rock. This would indicate that Northern Rock's borrowings are now likely to total in excess of £20bn. Simon Ward, an economist at investment management firm New Star, said: "As well as losing wholesale funding, Northern Rock has suffered a larger withdrawal by retail customers than the guesses of several billion pounds circulating in the market. He said that this view would fit with the record level of savings receipts reported by building societies in September. "Building societies account for about 20% of all retail deposits and enjoyed an inflow of £2.8bn last month, up from £1bn in September 2006."